The latest addition to the set released at the end of May. We have stock in now from the U.S. The Apollo 15 mission was the first mission designed to explore the Moon over longer periods, greater ranges and with more instruments for the collection of scientific data than on previous missions. The mission included the introduction of a $40,000,000 lunar roving vehicle that reached a top speed of 16 kph (10 mph) across the Moon's surface. The successful Apollo 15 lunar landing mission was the first in a series of three advanced missions planned for the Apollo program. The primary scientific objectives were to observe the lunar surface, survey and sample material and surface features in a preselected area of the Hadley-Apennine region, setup and activate surface experiments and conduct in-flight experiments and photographic tasks from lunar orbit. A total of three moon walks occurred during Apollo 15 for a combined duration of 18 hours and 33 minutes. Commander David Scott and Lunar Module Pilot James Irwin completed the first of the extended lunar scientific expeditions dubbed the J-series. 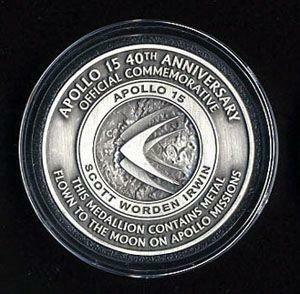 Apollo 15 televised the first lunar liftoff and recorded a walk in deep space by Alfred Worden. The scientific payload taken to the Moon was double the previous missions.